Today's eco tip is about saving dough - both bread and money! I live in a two-person household, so often we don't make it through a loaf of bread before it starts to go green and furry. So I today I have 4 different tips for households like mine to prevent this leftover bread from ending up in the compost, or worse, the bin. If you do often finish all of the bread in your house, but have someone who doesn't eat crusts then tips 3 and 4 can be made using just those discarded crusts. 1. This tip is the quickest, simplest, easiest out of today's tips - simply put the bread in the freezer after it's a few days old but before it starts growing mould. Bread in the freezer comes in handy when you have one of those mystifying weeks where you go through the whole loaf and then some, you'll have a back-up supply. It's also handy if you do a lot of travelling and only pop home for a night or two and don't want to buy too many perishables but still want to enjoy some bread. Now freezer bread isn't really ideal for fresh sandwiches but it is great for toast or toasted sandwiches (which is how I prefer to eat my bread anyway!). You can defrost the bread in the microwave before using it but I usually skip this step and instead - if making toast I cook it twice (some toasters even have a defrost setting for this exact purpose), if making a toasted sandwich I cook just the bread in the press for a little bit before turning it into a sandwich and continuing to cook it. 2. This tip comes from the bf and the bf's grandmother - use the leftover bread to make bread and butter pudding! There are lots of variations on this idea and I've even seen bread used as the base in a pie! Simply do a google search and I'm sure you'll find lots of creative recipes for yummy desserts that have bread in them. 3. 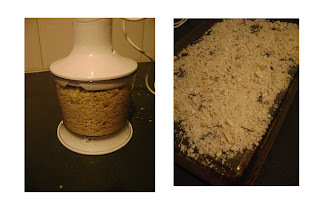 Make breadcrumbs! 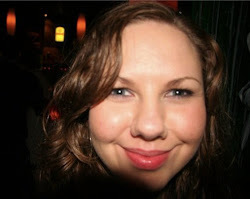 Yep you don't need to buy them, you can make them yourself - easy peasy! Now you can do this as soon as your bread reaches that inevitable point where it could start going mouldy any day or you can do what I do which is to keep storing the leftover bread in the freezer (and using it on occasion, re tip 1) and then when I have a bit of it I put in the fridge overnight to defrost and the next day I make breadcrumbs. Basically to make the breadcrumbs you need to tear up the bread to fit into your food processor, then process to your desired crumminess, next put a thin layer on a baking tray and bake until there is no moisture in the bread. Let the crumbs cool and store in an airtight container until use (they will keep for a while). 4. 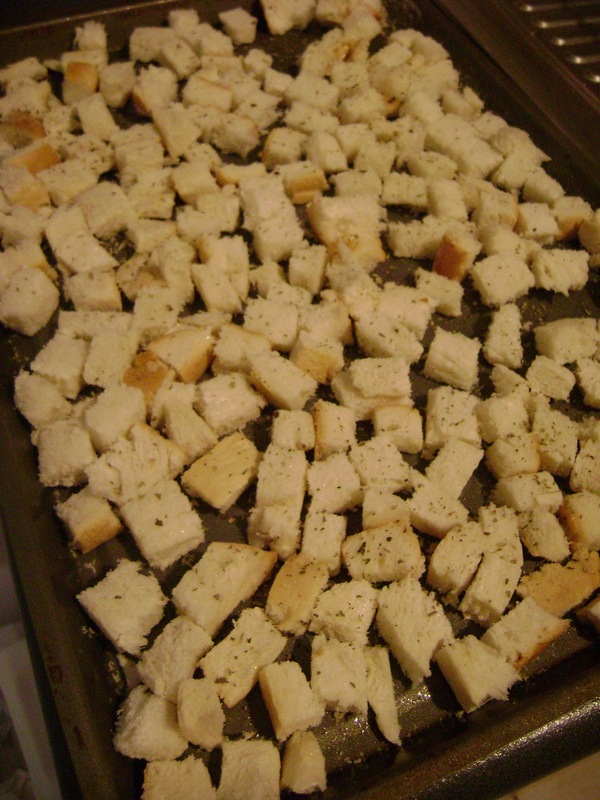 Make croutons! 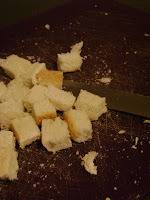 Again you can do this just before your bread goes mouldy or you can do what I do which is to keep storing the leftover bread in the freezer ( re tip 1) and then when I have a bit of it I put in the fridge overnight to defrost and then I make croutons. 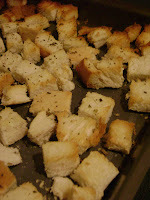 This is also pretty easy to do; you dice your bread into cubes (as big or small as you'd like), spray an oven tray with a little olive oil, spread a layer of the diced bread on the tray, spray the bread with a little olive oil, sprinkle with herbs (only if you want to, I use basil and oregano) and bake until golden brown. Let your croutons cool down and store them in an air-tight container, they should keep for a while. I hope this post can help you reduce your kitchen waste and even save you a little money. Feel free to to comment below with your own tips for using up bread and other kitchen leftovers.